After a period of closure following flood damage caused by Storm Desmond this nice little local was reopened a year ago by a couple from London who made a great effort to make a go of it. Unfortunately it was reported in this week's Gazette that they are calling it a day, hinting that people would rather patronise the likes of Wetherspoon's than support a friendly community local and pay a bit more for their beer. It will only reopen if and when a new licensee can be found. Ale was okay but I did feel like I was intruding in the breakfast room of a B & B rather than having a pint in a pub. 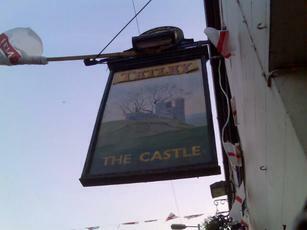 Castle re-opened after floods . Reported to be back to normal , thank the Lord. Next time I'm in Kendal The Castle is a MUST. Brilliant managers, great staff, grand beer and best Sunday Lunch in Westmorland. Darts,pool, doms, patrons who talk about any and everything. Bustling on Tuesday night when I called - dominoes being played in one room, a ladies' darts match ongoing in the bar and a large table of rather posh people having a private quiz in the lounge. Obviously a popular local, with a good atmosphere. I was rather surprised to be charged �2.90 for a pint of locally brewed Jennings ordinary bitter (3.5%) which, whilst the beer was perfectly drinkable, is what I would expect to pay in central London where ales of this strength are often considerably cheaper. Ok, good craic. Barmaid was rude and quite dour however.